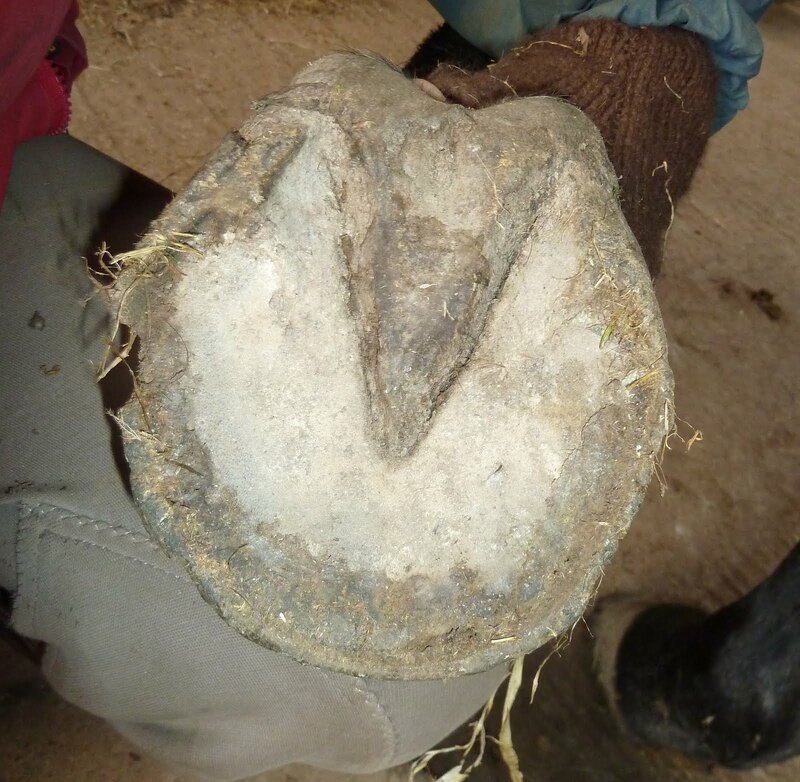 As with most horses when they go home, Patsy has grown about half a new hoof capsule and - again like most horses - once it has fully grown in she will have a hoof which is at a different angle both from a dorsal-palmar (ie toe to heel) and medio-lateral (side to side) angle. One of the things I am most pleased about with Patsy is that her left front leg - which was very twisted when she arrived - is beginning to be straighter. As a result her hoof is beginning to be more supportive, as you can see in the lower photo, which was taken yesterday. Yesterday, with the new hoof angle visible about half way down the hoof capsule. This is her right foot on arrival, with lines between the heels, widest point of the foot and through the frog. Below is the same foot, with lines between the same points - quite a shift, even though she has only grown half a new hoof. I am sure Patsy will go from strength to strength and of course I will post updates here as and when I get them! For me, its been a week of highs and lows. Rehabbing horses has to be one of the best jobs in the world, but as well as giving you tremendous exhilaration and happiness, it can also bring sleepless nights and intense worry. It was wonderful to get the fantastic news about Frankie and Lady over the weekend, both looking a million dollars and back doing what they clearly love. When I get bad news about ex-rehabs though, its a real kick in the teeth because once they have left here, its almost like waving goodbye to one of my own horses, and I really, REALLY, REALLY want them to carry on doing well and I get really, REALLY, REALLY upset if they don't. 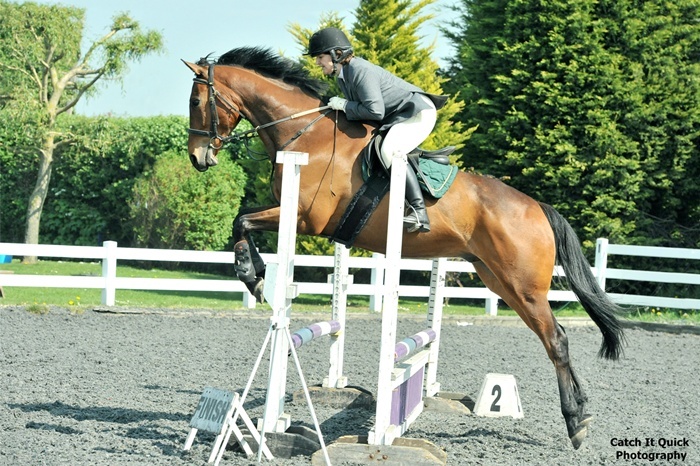 Fortunately, those sorts of set-backs don't happen very often, and its usually something which can be sorted out - a problem with too much grass, or an issue with saddle fit, or an injury which has given the horse a minor setback but which just needs careful handling to get the horse back on track. What makes me VERY angry, though, is if a rehab horse goes home and is harmed by a trimmer or farrier. 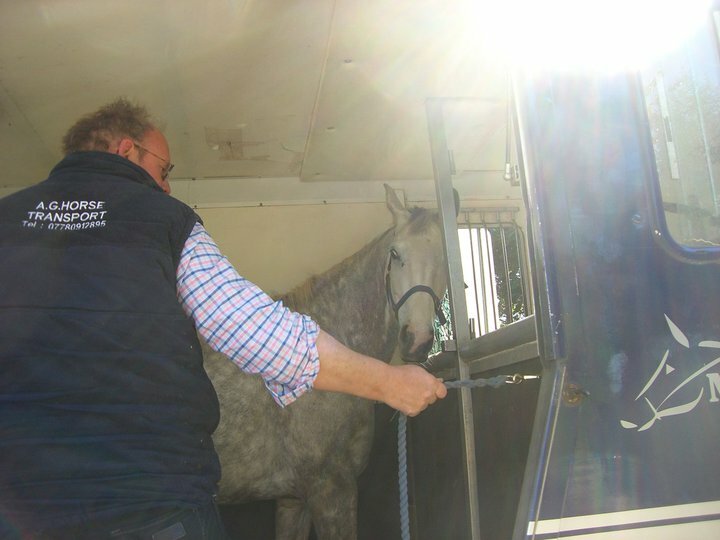 The problem is that most owners - quite rightly - feel that they want their horse's feet checked over by a professional every few weeks, but most trimmers and farriers - with the best of intentions - cannot leave well alone. Very few will turn up, walk and trot the horse, admire its feet, have a cup of tea and then leave. They have a compulsion to fiddle and unfortunately for the horses, they tend to fiddle with knives and rasps in their hands. Now, none of us are perfect and we all make mistakes - in my case plenty of them - but where I start to see red is if it happens not once but twice, and if the person whose made the mistake refuses to listen to what the horse is telling them - or worst of all, doesn't even bother to find out whether their bright ideas are benefitting or harming the horse. I always send rehab horses home with a detailed report which covers feeding and exercise, and I used to include a paragraph about trimming as well - usually something terribly diplomatic about the horse likely to need only minimal (if any) trimming, and about the importance of allowing the horse to assert its own medio-lateral balance. DO NOT EVEN THINK OF ALLOWING A FARRIER OR TRIMMER NEAR THIS HORSE'S HOOVES WITH ANYTHING SHARPER THAN A STICK OF CELERY. I can see how appealing the idea of shoes as "support" can be. Its something I've blogged about before because the word "support" is emotive - in the context of horses at least. 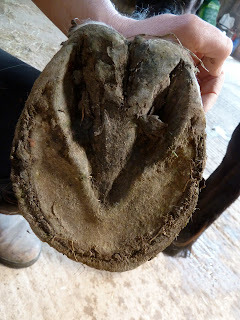 Usually, shoes are supposed to be giving "support" because the horse's hoof is compromised and can't function as well as it should - because of caudal hoof pain, ligament or tendon strain, flat feet or thin soles, for instance - and the shoe is intended to enhance hoof function. My suspicion, from the horses I see here, is that there is an issue with this approach. If you simply attempt to prop up hooves with external support its a bit like putting scaffolding round a building. 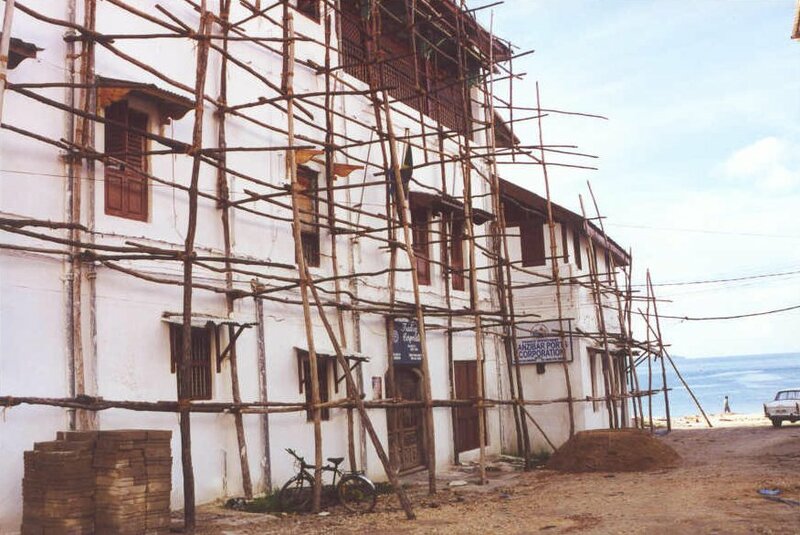 "The key elements of a scaffold are standards, ledgers and transoms. 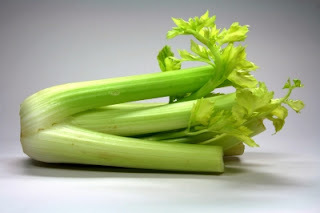 The standards, also called uprights, are the vertical tubes that transfer the entire mass of the structure to the ground where they rest on a square base plate to spread the load. " So, if shoes function like scaffolding, they've transferred the horse's weight so that its taken primarily by the shoe - round the rim of the hoof. Its taken the function away from the weak parts of the hoof - it might externally "support" them, but so far its done nothing to improve or rebuild them. The photo below is from a US site, and is billed as "a bar wedge pad for increased heel support." Of course, this is an extreme example, but here the "support" has prevented any normal function. Scaffolding is very useful, in the short term, if a structure would otherwise collapse, but the external support of scaffolding doesn't resolve a building problem or improve its construction. 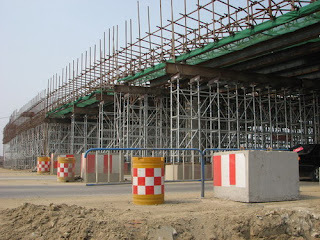 Its a temporary fix and has limitations because - while it may provide support - scaffolding restricts function. I'm fairly sure that you can't construct or repair a building by using scaffolding. To solve the underlying problem or construct the building you need to do some serious work on what lies behind the scaffolding. You need to be working on the foundations, the internal frame and workings - the whole structure from the inside out. If you do that successfully you might find that you have a building that doesn't need scaffolding any more - it might even function better without it. 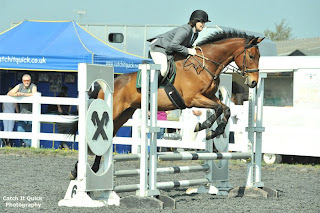 Lynn sent me this fabulous photo of Lady and Lauren, who went showjumping over the weekend. Lady was here at just about this time last year, and despite a few ups and downs, has gone from strength to strength! 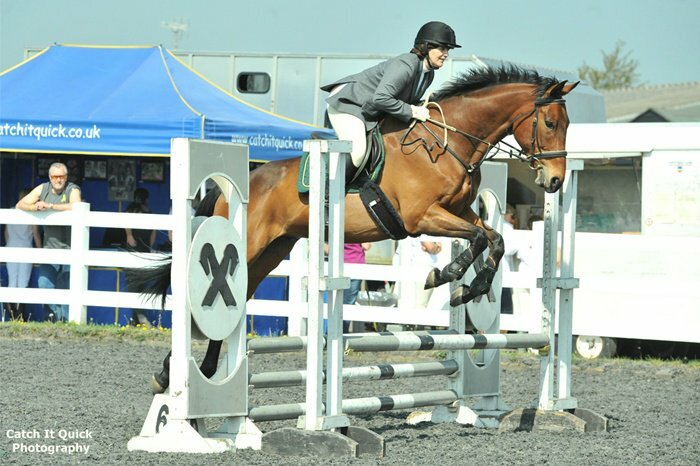 Cristina and Frankie also went showjumping and were double clear :-) Not only that, they came 6th - clever pair! Well done both of you, and keep up the good work! Blasted TalkTalk, the worst service providers in history, have failed again and the rockleyfarm.co.uk email address isn't working - hasn't been for a couple of days, by the looks of things. Zan is not only terribly handsome, he is also one of the kindest horses you could ever wish to meet. Very sensibly, he spends lots of time on the pea gravel because he arrived with extremely flat feet. It seems likely that he also had some medio-lateral balance problems, because it looked - rather like Oscar - as if his feet were overloading laterally in his shoes. If you look at his joints, his stance is improving but - also like Oscar - its likely that his hooves will appear asymmetric from the dorsal view. Zan has another problem - very thin soles and flat feet - so thin that if you pushed them with a thumb, they flexed, which is never a good sign. Often, the assumption is that horses who have flat feet are stuck with them. 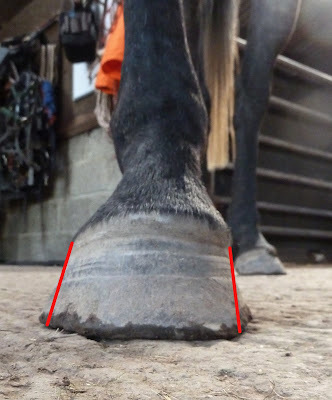 In fact, flat feet and thin soles are usually caused by a combination of dietary and loading problems and - like most aspects of a horse's hooves - they can be improved. You can see how under-run his feet are and also how little depth there is. There is a 6 week gap between the photos and you can see from the position of the nail holes (which are the chipped areas in the lower photo) how much growth there has been. Zan's growth at the moment is slower than some horses because his feet are too weak at the moment to be able to work him as much as I would like. The good news though is that the new growth is at a much better angle. 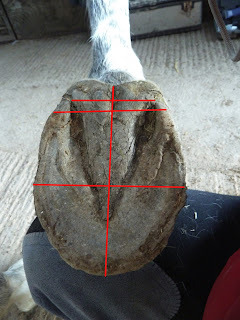 This is important because it will help in 2 key areas - firstly it will bring his toe back and give him more caudal support at the heel; secondly it will mean that once his new hoof capsule has grown in, his pedal bone will be suspended much higher within the hoof. A higher pedal bone means his feet will be less flat, have thicker soles and he will be much more comfortable and capable on tough surfaces. From the sole shots you can see that his caudal hoof is becoming stronger and the proportions of the foot are more normal. There is very little concavity, however, and its still a very weak, shallow foot - for the moment, anyway! Despite (or maybe because of) his epic day last week, when he and I clocked up 40 miles out hunting (our biggest ever recorded total), Felix is looking and feeling fantastic. In fact, talking to others who were out that day, although the horses went a long way and covered some very steep ground, none of them came back really tired - they were very hungry but were all bright and bouncing - especially in comparison with their riders(!). Maybe its because the weather wasn't too hot, maybe its because the ground is dry at the moment and so its not as tiring as in the winter when its deep and wet. Also, I suppose, by this time in the season all the horses are extremely fit and have huge reserves of stamina. Felix deserves extra credit, though, because he has now done over 800 miles this season. Add that to more than 700 miles last season (when I first had GPS to measure with) and all his previous 5 seasons, and, in total, he must have hunted thousands of miles barefoot. Of course, I did much less with him in his first couple of years, as he was only a youngster, but even at the most conservative estimate (say, 200 miles his first season, then 300, then 400, then 500, then 600) he must have covered at least 3500 miles (5600 km) over 7 seasons. 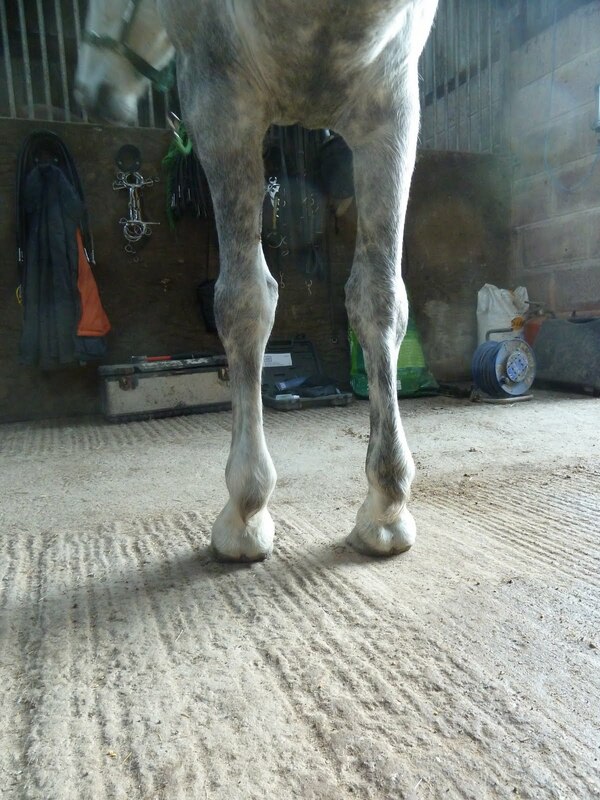 As a follow on from yesterday, here are some photos of Oscar, who is a good example of a horse who arrived with beautifully shod hooves which were fairly symmetrical. 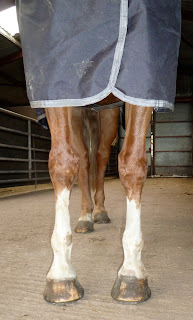 He had a noticeable twist in his left leg, it was difficult to get him to stand square and he was tending as a result to overload his hoof laterally. Below is a photo of Oscar today - its very easy to get him to stand square, he is loading his hooves more evenly and his limb looks straighter BUT his hooves are developing an asymmetry. Ironically, I believe its this asymmetry at hoof level which is allowing his limb to be straighter. 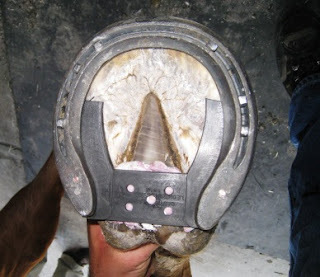 Its counter-intuitive to many hoofcare professionals, whether farriers or trimmers. We are taught that hooves are fairly static - that if they aren't symmetrical they will wear unevenly but in fact horses and their hooves are far cleverer. 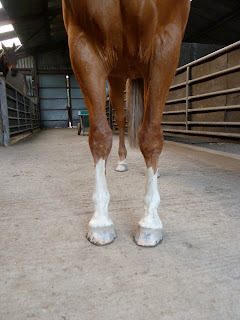 Hooves are dynamic - they change and respond to load and wear continuously, adapting, supporting, strengthening or weakening in response to external stimuli and the function they are being asked to perform. Generally, even in a well shod foot like Oscar's, the caudal hoof (the frog and heels externally and digital cushion and lateral cartilages internally) has less to do - here is his hoof straight out of shoes. Much of the load is taken by the shoe and with a passive role on most surfaces there is less stimulus for the frog to be well developed. Once out of a shoe, the load of the limb is carried quite differently and there is every need for the frog to become as strong as possible. It can change quickly under the right conditions - all these photos of Oscar were taken 8 weeks apart. Compare the caudal hoof in these photos - not only is it much bulkier and more robust after a few weeks out of shoes, but the development is more even. In the top photo the overloaded lateral side is much bigger and the medial side looks distorted. Even though Oscar's hooves appear, from a dorsal view, to now be asymmetric, they are actually loading more evenly than they were in shoes. Symmetry - for hooves - isn't a question of one half matching the other, its a question of even balance under load. 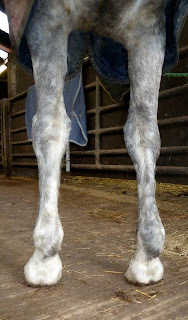 I posted photos of Lucy's hooves, and the fact that they are changing enormously, earlier in the week. I also took photos of her hooves from the front - the dorso-palmar angle - and the change in her hooves was equally dramatic. 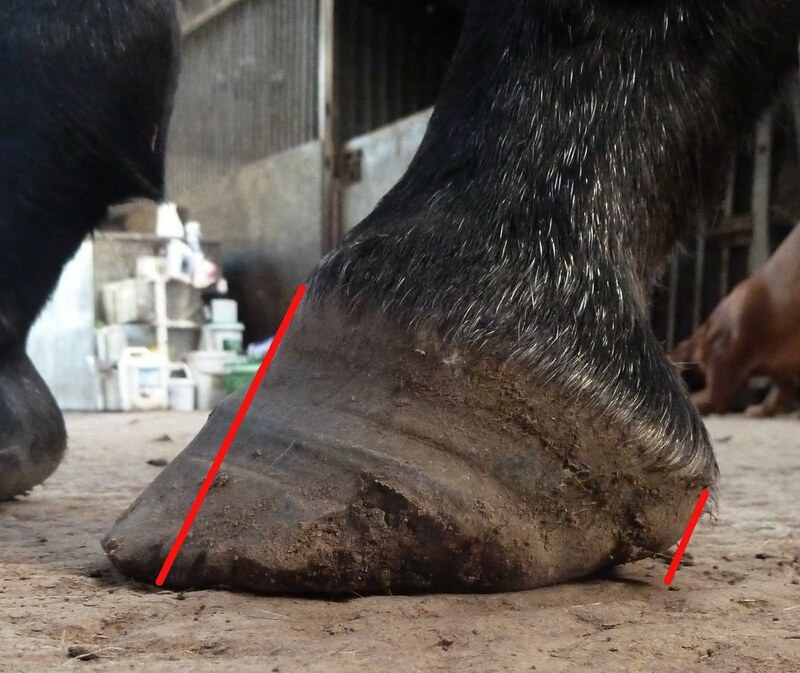 I've also posted a lot previously about wall deviations, and the fact that they can be essential for hoof balance even when they appear asymmetrical to the human eye. This is the RF, and as you can see from the angle change, there is a lot of rebalancing going on in her hooves. A lot of people would be horrified by the apparent asymmetry of the new hoof capsule (which is visible in the top band of growth). I remember Wiola commenting that Kingsley's hooves looked "grotesque" when the new angles became apparent. 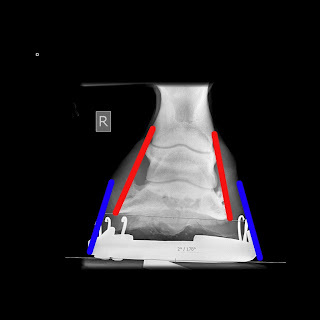 But - look at the x-ray of the same foot, and then suddenly the "grotesque", "asymmetric", "deviated" new hoof angle makes perfect sense. The x-ray of her hooves was taken just before she came here; its interesting that the difference in angles - which I've highlighted on the x-ray - is now being mirrored in the new hoof angle. The red lines are the joint angles, the blue lines are the old hoof capsule. 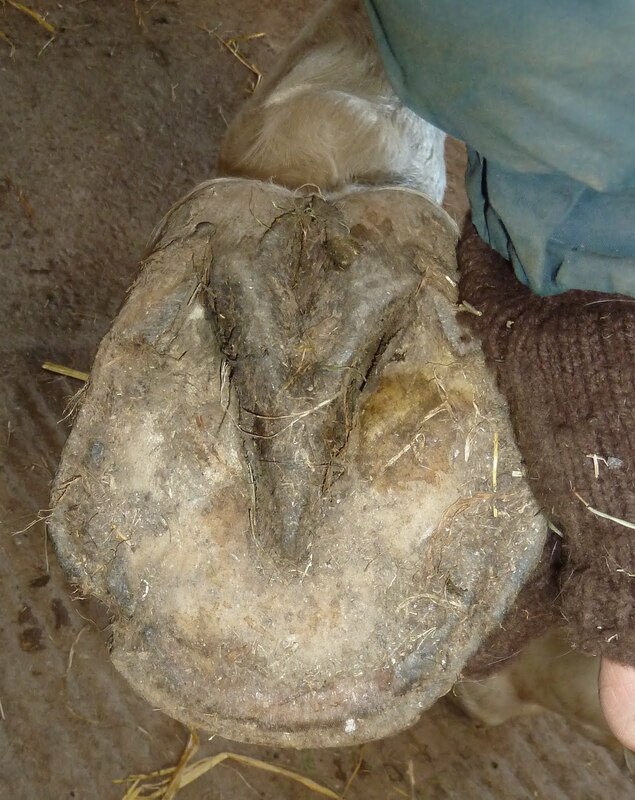 This is the hoof imbalance that was causing her collateral ligament strain and it had failed to improve with shoeing to the x-rays. In this photo, the red lines are the new growth - its fascinating how they match the joint angles more closely. Of course, x-rays aren't always available, but its interesting to wonder whether, with other asymmetric hooves, there is far more going on internally than we sometimes realise, and thats why they don't benefit from "symmetric" trimming. ...Harvey arrived on Sunday. 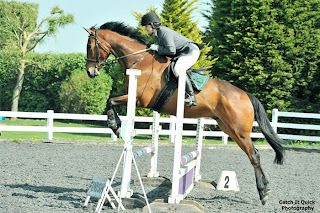 He is a 7 year old Quarter horse - not a common breed in the UK at all, and is a lovely little chap. 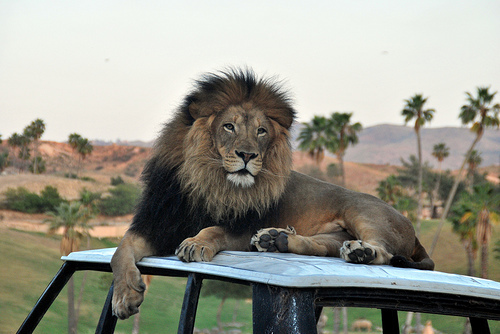 He is extremely sociable, and quickly made friends with Zan, Felix, Charlie and even Angel! Turned out overnight in a small field with a big view - Harvey is the blur trotting round and round Felix! 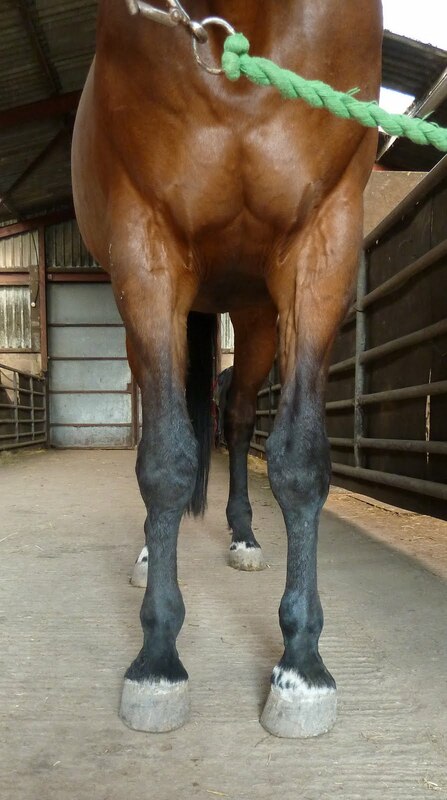 Harvey has had a long spell of lameness, which appeared to improve intermittently but then got worse again. 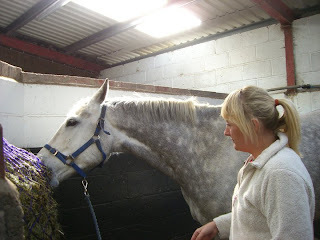 He came out of shoes 3 or 4 months before he arrived here but had previously been shod with Natural Balance, regular and plastic Imprint shoes, none of which had helped him, and in January he was diagnosed with DDFT and collateral ligament problems. His hooves have improved out of shoes but he still has a long toe and under-run heel and efforts to shorten his toe by trimming it just ended up making him very sore. His feet are a good example of how DDFT and collateral ligament problems within the hoof are not as clear-cut as being a shoeing problem, and equally can't be solved merely by so-called "barefoot trimmming"! Its the internal structures which need to be strengthened and developed, and I hope we will be able to help Harvey do just that over the next few weeks. Lucy has been on a mission almost from the day she arrived, and its really showing in her hooves. Unlike most horses, she was capable of lots of work on challenging surfaces from a very early stage and as a result her hooves - in 6 weeks - are showing the sort of development that often takes a lot longer. Here is her LF foot the day she arrived, straight after her shoes had been removed. Not a bad foot, with a reasonable frog. 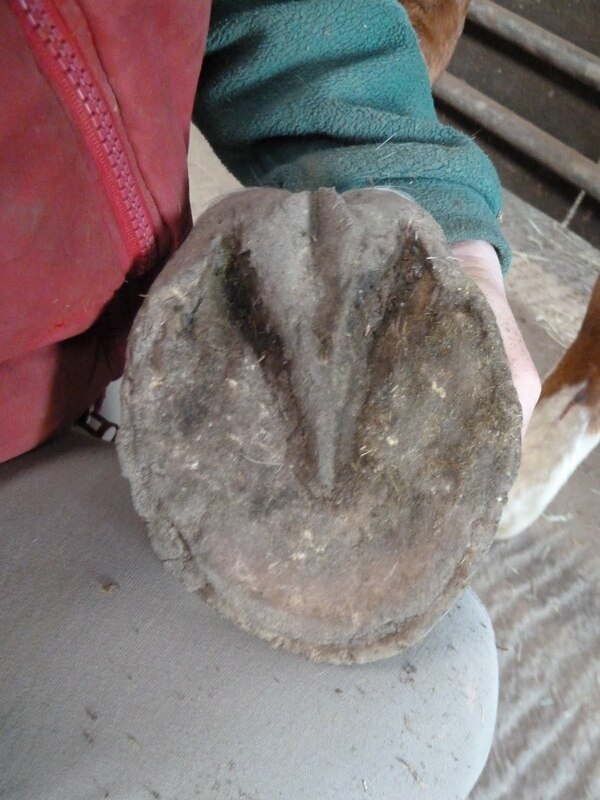 This is the same foot after 6 weeks, demonstrating how much the caudal hoof can develop once its worked correctly. 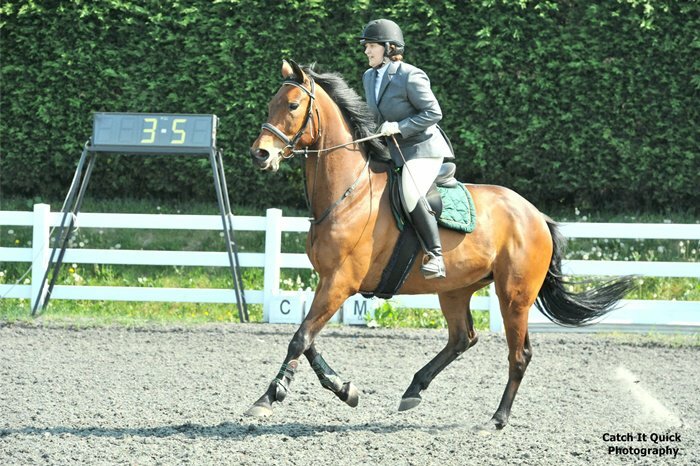 It helps of course that she is a young horse, but its mileage and surfaces that have made the biggest improvement in these feet. 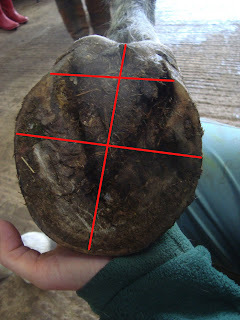 The lines show the likely angle change, once the whole hoof capsule has grown in. The toe will be shorter but the heel will also become more robust. Although the HPA doesn't look right at the moment, it will in fact be correct once the hoof wall angles are consistent. Still tired after a monster day's hunting yesterday - 39.9 miles on the GPS (about 65km), by far the longest day I've ever had. We covered an amazing variety of terrain, as always, from good old pasture to woodland, open moor and stony lanes. I was pretty amazed when I looked at the GPS to find we already had 30 miles on the clock, and were in the middle of nowhere, with miles and miles still to go. Quote of the day came from a well-turned-out visitor, who was riding back at the end with us. She had followed Felix all day and noticed he had no shoes, and said "I suppose you can get away with that on the moor". I try to always be polite to visitors, so I just smiled, instead of pointing out that several horses who'd lost shoes had had to go home early. I also didn't remind her that as well as being on the moor, we'd done a considerable part of our 40 miles over very nasty flints, old droves paved with big pointy rocks and along the roads - all at trot or canter. I also didn't say (as I would have liked to) "You don't need to shoes horses for Exmoor - tell you what, lets whip the shoes off and your horses can try hunting across the moor without shoes as well! Oops, they appear to be crippled..."
Party on! Rehab reunion is GO! Oscar and Dilly - lost and found! Hoofcare - simple or complex?